Three years after hosting Andrew Garfield and the other stars and filmmakers of The Amazing Spider-Man 2, a newly-minted web-slinging hero has arrived on our shores. Tom Holland, star of Spider-Man: Homecoming and Jacob Batalon, who plays Ned Leeds, graced the red carpet at the ArtScience Museum at Marina Bay Sands, Singapore on Wednesday, 7 May. F*** was there as attendees greeted the latest actor to don the red and blue bodysuit. Singapore is the first stop for the Spider-Man: Homecoming promotional tour; the movie opens in around a month’s time. Sony Pictures, which holds the film rights to the Spider-Man character, reached a deal with the Disney-owned Marvel Studios, leasing the character to the latter so Spider-Man could appear in the Marvel Cinematic Universe. This allows Spider-Man to interact with the other heroes in the larger Marvel universe, something which fans have long been hankering for. The title not only refers to the American high school tradition of the Homecoming dance, but has the meta-fictional implication that Spider-Man is now back where he belongs, standing shoulder-to-shoulder with other Marvel characters. This incarnation of the character was introduced in 2016’s Captain America: Civil War, aiding Team Iron Man in their fight against Team Cap. Spider-Man: Homecoming depicts how Peter Parker/Spider-Man’s existence is irrevocably changed after his return from the monumental airport showdown in Leipzig. Peter deals with life as an average high-schooler, but yearns to fight crime alongside the Avengers. Peter’s mentor Tony Stark/Iron Man (Robert Downey, Jr.) cautions him against biting off more than he can chew, but Peter is determined to prove his worth. Spidey battles Adrian Toomes/The Vulture (Michael Keaton), who uses stolen alien technology salvaged in the wake of the Avengers’ battle against the Chitauri to create cutting-edge weapons and gear. The Vulture and his cohorts Phineas Mason/Tinkerer (Michael Chernus) and Herman Schultz/Shocker (Bokeem Woodbine) menace New York City, endangering Peter’s loved ones – especially his dear Aunt May (Marisa Tomei). Deejays Justin Ang and Vernon A, known collectively as ‘the Muttons’, were the emcees for the closed-door event, during which select fans and a contingent of cosplayers dressed as various versions of Spider-Man and Spider-Woman from across the Spider-verse got to meet Holland and Batalon. The actors then took questions from the media at a press conference moderated by actor Adrian Pang. Holland has starred in films like The Impossible, In the Heart of the Sea, How I Live Now, Locke and The Lost City of Z – and he’s all of 21-years-young. He got his start in showbiz playing Billy Elliot in the eponymous West End musical. When asked what his impression of Singapore was, Holland enthused that it was as if he had “flown to a better planet,” describing the country as “so modern and beautiful”. Holland and Batalon posted the requisite selfie taken in the Marina Bay Sands Hotel’s famous rooftop Infinity Pool on Instagram. 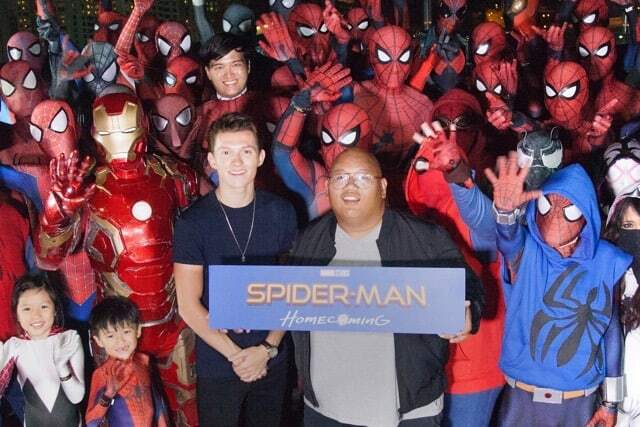 Also seen in the photo was Harrison Osterfield, Holland’s best friend who worked as a production assistant on Spider-Man: Homecoming. This is Batalon’s second movie credit; his first being the independent horror film North Woods. He described the experience as “surreal”, and that “every day felt like a dream.” Batalon plays Ned Leeds, who in the comics is Peter’s colleague at the Daily Bugle newspaper. The film alters the character such that he is Peter Parker’s best friend in school, and it was clear that Batalon and Holland shared an easy chemistry. “I hope to never wake up,” Batalon added wistfully. The scene in which Ned dons Peter’s Spider-Man mask was improvised by the two, and it got such a good reaction from the crew that director Jon Watts decided to build a scene around the gag. Holland has been upfront about how big a Spider-Man fan he’s been since childhood. At the Empire Awards five years ago, when a reporter asked Holland which superhero he’d like to play, Holland answered “I’d like to be the Spider-Man after Andrew Garfield, in ten years.” He didn’t know he’d get his turn much sooner. When Holland heard that Spider-Man would be recast, he begged his agent to pursue the role. Holland weathered a protracted process of auditions and screen tests, eventually working his way to a screen test with Downey Jr. himself. “The further down the line I got, the closer I got to the part, the more I wanted it,” Holland shared earnestly. Funnily enough, Holland found out that he was selected for the coveted role via an announcement on Instagram. “My brother Harry, he’s quite savvy with computers, and he told me ‘dude, they’ve probably been hacked,’” Holland recalled. Shortly after learning the news of his casting, Holland received a call from Marvel Studios president Feige, making it truly official. Audiences will get to see what happens for themselves, when Spider-Man: Homecoming opens in theatres in Singapore on 6 July 2017.